Created on Feb. 2, 2013, 7:39 p.m. by Hevok & updated by Hevok on May 2, 2013, 5:15 p.m. The Web of Data is most likely represented by the Linked Open Data which is a huge cloud of documents and information that are provided with the help of the Resource Description Framework (RDF). There are billions of acts and millions of links between facts that are grounded in knowledge bases and publically available. There are general information about resources, as well as information to Science, bibliography and multimedia and especially a lot of information related to medical and biological Research because it is an area were Artificial Intelligence and Natural Language Processing are making big progress. Linked Open Data (LOD) denote publicly available (RDF) Data in the Web, identified via URI and accessible via HTTP. Linked Data Link to other data via URI. These all can be considered as a huge global database. Linked Data is a sea change akin to the Invention of the WWW itself. We have gone from a Web of documents, to a Web of data. We have to go on a crusade for everyone from government departments, to individuals, to open up their data and put it on the Web - so that others can link to it and use it. Linked Data is an official W3C Project. It is about using the Web to connect related data that was not previously linked, or using the Web to lower the barriers to linking data currently linked using other methods. Use URIs to identify objects that are exposed to the Web as resources. Use HTTP URIs so that agents can locate and look up (dereference) These objects. Provide useful Information about the resource when its URI is dereferenced. Include Links to other, related URIs in the exposed data as a means of improving Information discovery on the Web. Linked Data allows to discover, connect to, describe, and re-use all kinds of data. It is to data what the World Wide Web was to documents back in the 90's. 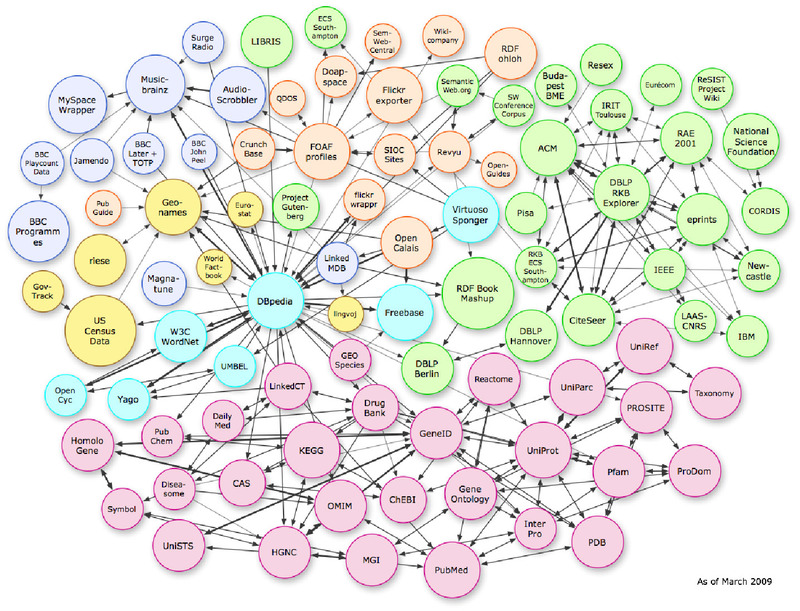 Linked Data builds on and interconnects existing Ontologies such as WordNet, FOAF, SKOS. The datasets grant access to their knowledge bases and link to times in other datasets. The Project follows Basic design principles of the World Wide Web: simplicity, tolerance, modular design, and decentralization. The Linked Open Data Project Counts more than billions of RDF Triples, which is a lot of knowledge. The participating datasets are rapidly growing. The datasets can be accessed in heterogeneous ways for example, through a semantic web browser or being crawled by a semantic search engine. Linked Data is there to be used. Linked Data enables data to be opened up and connected so that Agents can build interesting new things from it. Linked Data can be described as boxes of data that - when connected via open Standards - enable things to sprout from it. Linked Data is one of the most important Trends of the Web.